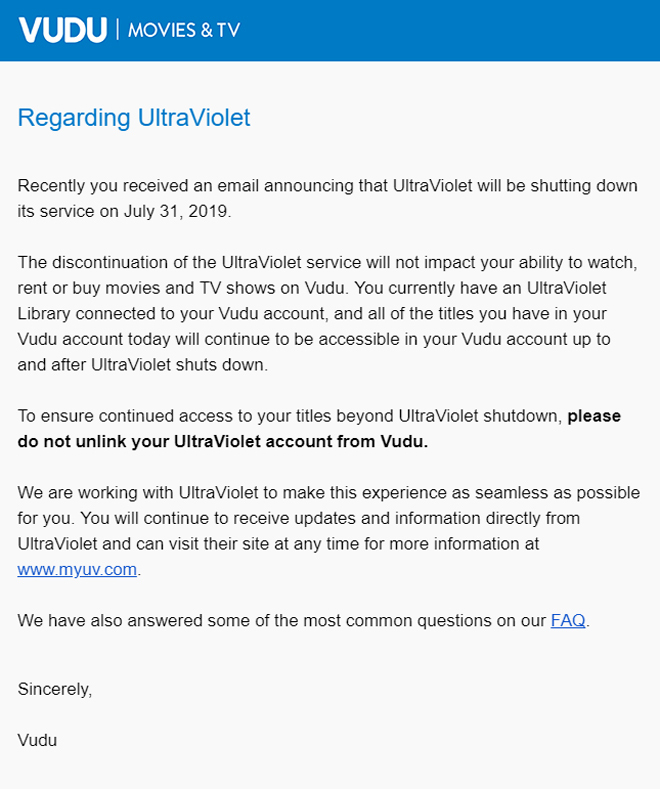 UltraViolet has announced plans to terminate its service on July 31, 2019. The platform was designed to redeem and link digital copies to various online retailers. The decision to end UltraViolet likely comes as a result of increased support for Movies Anywhere, a rival digital locker system developed by Disney. After July 31, all UltraViolet libraries will be closed. With that said, the majority of movies and TV shows added to a user's library before the termination date will remain watchable via previously-linked digital retailers like VUDU, Fandango NOW, Kaleidescape, Paramount Movies, and Verizon Fios. Users can still manage and add linked retailers to their accounts now at myuv.com. In addition, customers will still be able to redeem digital codes following the service's termination, but those titles may only be accessible through the retailer they are redeemed at. Meanwhile, rival service Movies Anywhere will continue to offer similar functionality as UltraViolet with support for redeeming and linking digital titles from a variety of studios through numerous online retailers. That platform is currently compatible with Comcast Xfinity TV, VUDU, iTunes, Google Play, Amazon Prime Video, Microsoft Movies & TV, and FandangoNOW, along with a growing collection of movies from Disney, 20th Century Fox, Sony, Warner Bros., and Universal. Unlike UltraViolet, however, Movies Anywhere does not currently support TV shows or content from Paramount and Lionsgate.